Use GIF Studio to crop GIF animations to maintain image quality. The user can select the image area of interest and at the same time cut a portion of the video from its timeline. It’s the best ways to reduce the size of GIFs in GIF Studio. In this demo, we cut the animation both from the image and its timeline. The original GIF contains 4 frames, 1200×800 pixels each. The file size is 3Mb. The generated GIF has 2 frames, the image size is 600×800 pixels. The resulting file size is only 500Kb. GIF Studio provides the following information when cropping GIF animations. Image pixels are used to mark the dimension which is consistent with the generated GIF. Width: the width of the output GIF in pixels. Height: the height of the output GIF in pixels. X: the cropping handler’s x-axis position in pixels. Click this icon to unlock the aspect ratio of the cropping area. User can adjust the width and/or the height of the cropping area. Cut a square image. User can only adjust and area size and position. The area aspect ratio is fixed to 1:1. 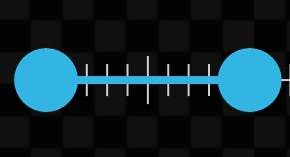 Use the Range Selection to cut a portion of the video from its timeline. The selected portion is marked by the start and stop frame indexes. Do remember to like us, invite friends and give us feedbacks on Google Play Store. Together, we make GIF Studio a better App!